Taste test: These chips are thick, crunchy and very crisp. 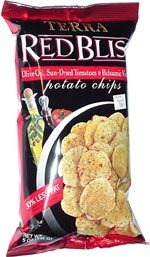 They feel very light, too, especially for a thick chip. They taste just like the name says, with quite a lot of flavor. Some of our tasters found the flavor to a be a little bit too highbrow for them. Smell test: Wow, quite an aroma. Smells like olive oil and sun-dried tomatoes, like a real Italian meal.